News from LMCU: Affordable Financing! Affordable home improvements start with a great rate! Get our lowest rate ever! Call, click, or visit any LMCU branch to find out how to make your home’s equity work harder for you! *Promotional rate available for well-qualified borrowers with new HELOCs opened 5/1/17 to 7/31/17. APR= Annual Percentage Rate. Rate assumes auto-pay from LMCU checking account. 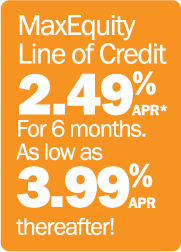 Your rates may vary depending on your specific credit profile. HELOC rates are variable and will not exceed 12%. Home Equity lines of credit require a minimum credit score of 720 to qualify for the 2.49/3.99% APR with 80% LTV. Home equity lines of credit are available for homes located in Michigan and limited counties in Florida **Applies only in Michigan. See branch for details.